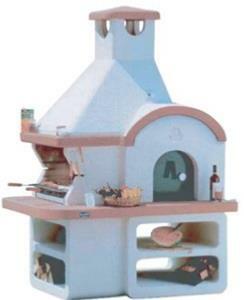 Outdoor masonry barbecue with pizza oven ready for self-assembly. The table top and chimney plate are terracotta-coloured. The oven comes with iron door and thermometer and should be fired with wood. The barbecue has an integrated spit holder and comes complete with fire-bricks, cast-iron grid, ash box, ready-mixed mortar, white artex paint. 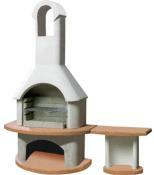 Stainless-steel grill included, adjustable on four levels. 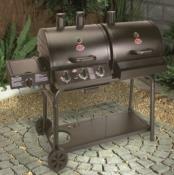 Barbecue grill for use with charcoal only; oven can be used with charcoal and wood. Special Offer: Includes Free Fibre Ceramic Table Matt Worth £179.99. 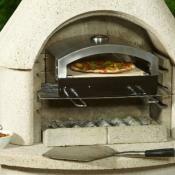 Please Note: This BBQ is made to order in Italy so the the delivery lead time is 4 to 6 weeks. Delivery Usually 4 to 6 Weeks.